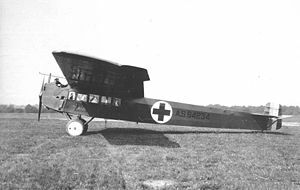 The Fokker F.IV was an airliner designed in the Netherlands in the early 1920s, but built to the extent of only two examples, both for the United States Army Air Service. It was a typical Fokker style (though the largest they had yet built) high-wing cantilever monoplane with fixed tailskid undercarriage. The pilot sat in an open cockpit alongside the engine in the manner of the Fokker F.III, while a cabin inside the fuselage could seat twelve passengers. Before the aircraft had even been built, the United States Army Air Service had bought two examples during a promotional visit to the country by Anthony Fokker. Built at Fokker's factory at Veere and flight-tested by Anthony Fokker himself, the two aircraft were crated up and shipped to the United States where they were erected at McCook Field and given the designation T-2. Despite Fokker's hopes that increasing airline passenger numbers would create interest in aircraft of larger seating capacity, the F.IV was too large for the needs of contemporary airlines, and no further machines were sold. One of the T.2s was used for a number of long distance flights over the next few years, culminating in the first non-stop transcontinental flight across the United States, an idea that originated with Lt Oakley G. Kelly, one of the T-2's test pilots. The Army agreed to let Kelly have the aircraft specially modified to carry more fuel, and to install a connecting doorway between the cabin and cockpit so that he and fellow test-pilot Lieutenant John Macready could take turns flying and resting. An extra set of controls was also installed to facilitate the handover from one pilot to the other. As modified, the T-2 would take off with 2,350 L (620 US gal) of fuel onboard, making it 1,110 kg (2,450 lb) over its prescribed maximum take-off weight. In late 1922, Kelly and Macready made two attempts at the transcontinental flight. The first was made on 5 October 1922, departing San Diego, California for New York. After 35 hours 18 minutes in the air, they were forced to abandon the attempt and land due to fog. This would have been a world duration record, but without a barograph on board, it could not be officially recognised by the FAI. Kelly and Macready tried again on 3 November, but this time engine trouble forced an emergency landing near Indianapolis after 25 hours 30 minutes. The following year, they made a long-duration flight over a closed circuit over Dayton, Ohio, remaining aloft for 36 hours 14 minutes 8 seconds between 16 and 17 April. This established a new world duration record, but also a new distance record, weight record, and eight various airspeed records. On 2 May, they set out from New York to attempt the transcontinental flight again, this time travelling in the opposite direction. 26 hours 50 minutes later, they landed in San Diego, having covered 4,034 km (2,521 mi). Their aircraft is preserved in the National Air and Space Museum. The other T-2 was converted into an air ambulance and given the designation A-2. Picture - Fokker T-2 on display in Washington, D.C.
"The Fokker "F.IV"". Flight: 858-59. 29 December 1921. http://www.flightglobal.com/PDFArchive/View/1921/1921%20-%200858.html. Retrieved 2008-03-27. "Fine American Duration Flight". Flight: 615. 19 October 1922. http://www.flightglobal.com/PDFArchive/View/1922/1922%20-%200615.html. Retrieved 2008-03-27. "Thirty-Six Hours in the Air". Flight: 232. 26 April 1923. http://www.flightglobal.com/PDFArchive/View/1923/1923%20-%200232.html. Retrieved 2008-03-27. "Endurance Records Broken". Time. 28 April 1923. http://www.time.com/time/magazine/article/0,9171,880639,00.html. Retrieved 2008-03-27. "Across America". Flight: 248. 10 May 1923. http://www.flightglobal.com/PDFArchive/View/1923/1923%20-%200248.html. Retrieved 2008-03-27. "Coast to Coast". Time. 12 May 1923. http://www.time.com/time/magazine/article/0,9171,846026,00.html. Retrieved 2008-03-27.